Our Instructors have years experience teaching kayak instruction following up-to-date ACA Standards, giving you updated instruction methods. Enjoy our completely private, secluded Tres Monjas Patagonia Eco-Camp that has been designed specifically for the whitewater guide. Experience the genuine culture of Chilean Patagonia from this spectacularly situated alpine village – a true cultural immersion experience awaits you. Imagine Telluride Colorado one hundred years ago! Most of our instructors are over trained for the positions they hold with us, but they keep coming back year after year to work in this spectacular location. Read more about them on our Guide Instructor’s page. Who are your Swiftwater Rescue Classes designed for? Our classes are designed for Firemen, Law Enforcement Personnel, Search & Rescue Professional and Aspiring River Guides. I need to re-certify in Swiftwater Rescue. Will your course count? Yes, our swiftwater rescue course will serve to re-certify you as well as give you new skills. I am a search and rescue professional that has no desire to learn how to be a raft guide. Can I still take the Swiftwater Rescue Class? Yes! We will customize your itinerary so that you can do the multisport activity of your choice while the rest of the group is out rafting. Do you offer Rescue 3 Swiftwater Rescue Training WRT- Level 2? Our instructional staff is capable of offering this course but we do not have it formally scheduled. If you have a group that is interested in Swiftwater Rescue WRT - Level 2 please contact our office for a custom itinerary. I want to be a river guide on the Futaleufu. Will your River Guide School guarantee me a job with a company on the Futaleufu? Unfortunately not, but many of our graduates have gone on to become guides on the Futaleufu. Guide jobs on the Futaleufu are coveted positions in the industry and not many slots are available. Getting a guide job on the Futaleufu requires the right skills and the right timing. However, we encourage all of our guide school graduates to apply to Expediciones Chile for a position the following year. Graduates of our guide school are given preference over candidates who have not attended. 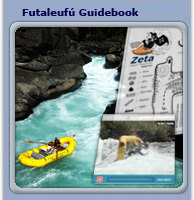 Will your river guide school give me the skills required to raft guide on the Futaleufu? Not necessarily. Some people pick up boat piloting and captaining very easily and others have to struggle to gain the expertise. The Futaleufu is one of the most difficult commercially run rivers in the world - even seasoned raft guides from other rivers are apt to have difficulty on it. Plan on doing a year's intership on the Futaleufu before becoming a raft guide - this is the more likely progression. Experience a Horseback riding vacation like no other with with genuine Guachos &Chilean Criollo horses.